Ergonomics is the science/art of making the interaction between the equipment and the persons using the equipment as physically stress free as possible. 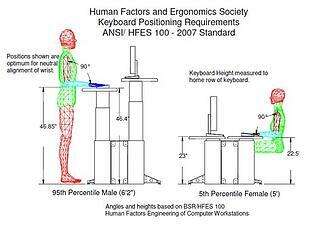 Correct ergonomic design as defined by The Human Factors and Ergonomics Society, (HFES) and certified by the American National Standards Institute (ANSI) dictates that the intensive use computer workstation be designed to fit a wide range of user sizes/heights from the 5th percentile seated female (4'11") to the 95th percentile standing male (6'4"). Dispatch Communication Centers present unique challenges to the ergonomics of a workstation. 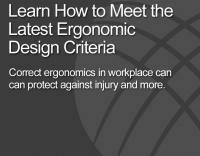 When it comes to health and productivity, ergonomics should be a key factor in the purchase decision. Correctly adhering to these five factors can lead to increased productivity, reduced turnover, better employee satisfaction, reduced absenteeism and a reduction in workers compensation claims due to musculoskeletal injuries. Further discussion - which is best; sitting or standing? Even if your workstation is set up properly, you can still get muscle fatigue from maintaining the same position for too long. Frequently changing positions promotes blood flow to the large muscle groups, which keeps your metabolism humming along and your brain synapses firing. The key to better ergonomics and health is movement throughout the day; a combination of sitting and standing. Your consoles, tables, desks, furniture systems and workstations should be easy to use, and should also adjust to your personal, most comfortable working position – either sitting or standing. SHOULD BE EASY TO USE -- should require little or no training and no physical effort to adjust. ALLOW YOU TO BE IN THE MOST COMFORTABLE WORKING POSITION -- the least stressful postures are proven to enhance productivity and comfort.